The “one ball per player” is the main focus of the second phase of player’s development. In this stage, players will start to learn more about commitment, positions, defending alongside attacking but complex tactical work still should still not be integrated. Make your sessions dynamic, player centered with a slow start of the team concept being incorporated and instill focus and discipline. Sessions should be two per week. Understand that player attention span is still short but players should be challenged to carry on a task and listen while things are being explained. Don’t be result oriented as your team will start organized competition and some might even play in tournaments. Don’t promote with your players/parents the importance of results. Important step of long term player development is the parent education as well. Educate your parents that this is just one step of the long journey and that kids are loved and appreciated for many things besides soccer. They’re valued just as much when they lose the game. If you ignore or skip this opportunity to educate the group about your club’s philosophy you will pay the price down the road. (read about 4 Steps to Building an Effective Club Culture). There will be parents with their own agenda that will pull the kids out of your program. It might be tough but better to clean house early and set the right expectations with everyone included. In this phase, as well as in the next one, be aware of the winning at all cost trap. It will be easy and tempting to play players that can win you games (faster, bigger, taller players) at these ages (here is an article about Development Over Winning: 8 Aspects of Proper Player Development). The bottom line is, this approach is short-term and will not work down the road. Continue focusing on ball familiarization with your players. For a good portion of your session, especially at the beginning, one ball per player should be a norm. Players need to be encouraged and challenged by the coach to try different moves, feints, skills while going into space. Pay attention to the detail and address them with your players. Now is the right time to teach proper technique and reinforce building right habits because players are very receptive to learn new things. Passing/receiving exercise should start being incorporated also, but as a part of a sequence: pass-receive- take players while changing multiple directions. As you get into scrimmage, there will be passing involved but don’t let it become the main focus. It can look very nice that a bunch of 9-10 year-olds are looking like mini FC Bayern Munich squad but it can be detrimental to player development. They will also love the opportunity to just kick the ball away for the fun of it or because the lack of comfort. Make sure you address this with players that need help understanding the importance of controlling the ball, looking up and engaging players in 1v1, 1v2 and even 1v3 situations. Players are still involved because they want to be around their friends. Also, sessions should be fun and engaging while keeping things simple, player per ball to ensure proper development, focus and positive environment. In the player’s mind it’s all about themselves, which is fine, but we should slowly start introducing the concept of the team. With the short attention span your players will not be able to focus for a long period of time. It is our job to increase that and keep our players accountable. The accountability level for 9-10-year-olds is not the same as for older players but they should be able to focus and LISTEN while you’re explaining the exercise. They also need to be able to carry on the task without much time spent on re-explaining. Keep in mind that won’t necessarily mean they’ll execute the exercise perfectly but that they’ll know what you’re asking them to do. So, by instilling focus and discipline into your players, you’ll be preparing them for the next stage of their development path. Most of the physical part can be achieved by just letting your players play and incorporate games that will have turning, jumping, catching, running exercises. This is where they will have the most fun and engage themselves the most. Another aspect to continue working on is going to be lots of coordination exercises, all of which can be done with the ball. Tactical aspect for these ages is generally irrelevant. Anything complex you try will be either shut down by players, won’t be understood or simply won’t be beneficial. At the most, players should start thinking about basic understanding of positions and where they should be standing on the field. 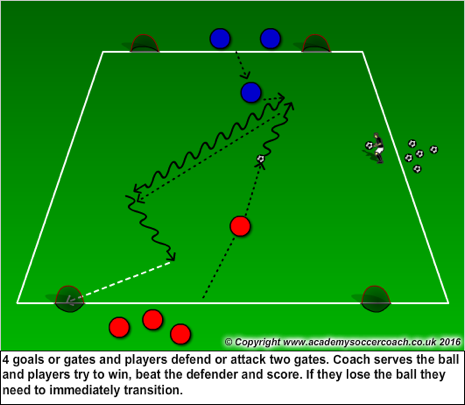 Another aspect to consider is teaching them how to handle defensive 1v1 situations. Under tactical arrangement you have to include is player rotation. Your players must try playing in more than one position in order to understand demands of each one of them. You’re doing them a big favor by rotating players around. Number of players will go to 7 v 7 format, with mandated changes starting with the 2016-17 season. Recommended formation should be 1-3-2-1 with – goalkeeper, central defender, 2 outside backs who will join in the attach, 2 central midfielders and 1 forward. Another option is to go with 1-2-3-1 where instead of 3 defenders you will have 3 midfielders. The idea behind this is for two wide players to play up and down the field. How realistic is it to expect from your players to do that? Probably not high but you need to start creating right habits that they will be able to carry later in their careers. In conclusion, program for U9 and U10 players is just an extension of the first phase. The focus is on making sessions fun, engaging, challenging and safe while instilling focus and discipline in your players. Remember, in the previous post (click here to read about Introductory/Fundamental Period, 4-8-year-olds) we spoke about developing the love for the game. Now, our responsibility is to build on that. Keep the focus on development and not results while educating both, players and parents during this important stage. Here are some practice activities that can be adapted to suite your players. Drago is currently a Pro Soccer Coach for the Cedar River Soccer Association (CRSA). CRSA has been among top clubs in Iowa for years due to their approach to developing young players. This long term approach that may not pay dividends right away, but has well proven success down the road -- winning 40 state cup championships! Drago is originally from Belgrade, Serbia where he played from youth to senior ranks for over 16 years. Drago earned a Bachelor's degree while playing for Mount Mercy University where he started all four years, was All-Conference selection all four years, and MVP in 2006. For the past four summers he played for the Vermont Voltage PDL team. Drago has spent time coaching in Vermont, Xavier and Linn-Mar High Schools. He holds the USSF 'C' license.